Does Fiction Sometimes Grate on Your Last Nerve? I’ve been enjoying literary agent Ann Byle’s “I’m Annoyed by Christian Fiction” series of posts, starting here (be sure to read the whole series–there are some things she likes about it, too!). As annoyances, she names things like too many “zings” per page. A “zing” is when the hero admires the heroine’s alabaster skin and the heroine admires the hero’s rippling biceps–some zings are needed to establish attraction, but too many can be like too much pepper in the soup. A little goes a long way. Another phenomenon Ann mentions is the “I’m fine” syndrome, where characters toss off deep lacerations, lack of food or sleep for days, etc., with a glib “I’m fine,” reminding me of Monty Python’s Black Knight: “‘Tis but a flesh wound.” (stagger, stagger). Several readers joined the chorus, expressing fatigue with heroines who are impossibly beautiful, heroes who are invariably handsome, and damsels who forget to eat when under stress. (Some people do lose their appetite. Others rip through entire boxes of graham crackers smeared with Nutella. Don’t ask). I have a few pet peeves of my own, including loving and loyal best friends who appear in exactly one scene and are never heard from again, simply to advance some plot point, and children who remain unflaggingly adorable, winsome, and charming for an unrealistic 24/7. Anyway, I was relieved to see that You’re the Cream in My Coffee does not annoy in the ways Ann and her followers mention. *Lead character Marjorie is not impossibly beautiful. She’s not even particularly slim. Her hair tends to frizz, and she laments that the straight, boyish fashion silhouette of the 1920s does not work well with her curves. *The man she’s engaged to marry is good-looking, but he wears spectacles, so his vision is not 20/20, so he’s not an unflawed specimen. And The Other Guy has a rugged battle scar down one side of his face. Think Ross Poldark. AHA! You thought I was going to give something away, didn’t you? Not a chance. What annoys you about the fiction you read (Christian or general)? What do you like best about it? 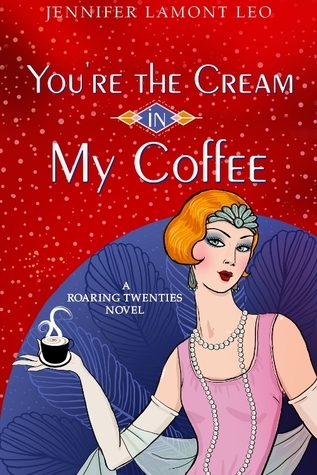 You’re the Cream in My Coffee is available in Sandpoint, Idaho, at Sandpoint Super Drug, Vanderford’s, the Bonner County History Museum Gift Shop, and the Corner Bookstore, and in Coeur d’Alene at the Sower Bookstore and the Well-Read Moose. Support the little guy! In many cases you can order online or by phone. If all else fails, of course, there’s always that big South American river. Here’s a shout-out in support of Alan Sorrentino. As an aid to those who don’t get out much, yoga pants are extremely tight-fitting pants that aren’t so much figure-flattering as figure-outlining. They leave little of the female anatomy to the imagination. In their proper place–i.e., a yoga studio–they are stretchy and comfortable and help instructors observe that poses are being done correctly, that the proper muscles are being engaged, etc., –similar to why ballet students wear leotards and tights. Except that leotards and tights have never caught on as a fashion trend for grown women, unless gracefully covered by a skirt or wrap when the wearer leaves the studio. Yoga pants, on the other hand, have been embraced as an everyday clothing choice by women everywhere–meaning that eyeballs everywhere have been subject to some pretty blush-inducing views. I wrote about yoga pants nearly two years ago, which would indicate that the trend isn’t fleeting. As they are the antithesis of Sparkling Vintage style, no regular reader of this blog should be surprised at which side of the debate garners my sympathies. Good for you, Alan Sorrentino, for expressing your opinion. A few years ago, I expressed mine concerning the disconnection between young girls’ clothing choices and their desire not to be “objectified” by males. At that time I suggested that if they (or their parents) did not want men to view them as sexual creatures, perhaps they should not dress in a way that flaunted their sexual characteristics. I was subsequently accused of everything from being hopelessly old-fashioned (okay, guilty) and a wizened old prude who wants to restrict everyone’s Freedom to Be Themselves, to downright hating women and letting myself be manipulated as an unthinking tool of the patriarchy. A few people told me privately that they agreed with me, but they did not wish to say so publicly so as not to be similarly tarred and feathered. So that’s why I’m standing up for Alan Sorrentino today. Kudos to you, Mr. Sorrentino, for having the courage to state your opinion. Thank you for expressing a wish to see both women AND men dress with dignity. The only place where we disagree is that you think women “over twenty” should not wear them in public, while I don’t think any woman should wear them in public, unless with a shirt long enough to cover the aforementioned area. My feelings about the matter have little to do with how much they flatter or frumpify a woman’s figure and everything to do with how they smash her grace, modesty, and dignity to smithereens. Sparklers, what do you think of yoga pants worn in public? Today I’m delighted to welcome Elaine Marie Cooper to A Sparkling Vintage Life. Elaine’s newest novel, Saratoga Letters, set in New York during the Revolutionary War period, releases this week from Lighthouse Publishing of the Carolinas. Enjoy listening in on our conversation, and if you have any comments or questions for Elaine, leave them below or get in touch with her at elainemariecooper.com or on Facebook. Jennifer Lamont Leo: Welcome, Elaine! When will Saratoga Letters be published? JLL: The story is set in Saratoga, New York, in 1777. What has intrigued you about this time and place in history? EMC: Several things. First, since I grew up in Massachusetts, I have long been enamored with the history of the beginnings of our country. But I was particularly drawn to Saratoga because my own ancestor fought in the battle there in 1777—as a British Redcoat! I had long wanted to visit the site because of that. When I was there, my writer’s muse became intrigued by the possibility of a multigenerational suspense story. This was a first for me and I’m very excited about this story! JLL: Tell us a bit about your research process for Saratoga Letters. Do you have any favorite resources that you turn to for research? EMC: My very favorite sources for research are historians. I love picking the brains of those who share my love for history. They never ask why I need a minor detail about something—they just understand. Saratoga Letters took on a whole new challenge however because I was researching two completely separate centuries. It was a huge challenge to get details about 1977 because there was no internet then and many of the real-life details were often hidden in old newspaper stories or files in a historical archive. The great part about this was meeting so many helpful contacts in the Saratoga area. I’m so grateful for their help! JLL: What do you most hope readers will take away from Saratoga Letters? EMC: I think the key thought that readers of this book may take away is a truth about good vs. evil. EMC: My biggest challenge this past year has been my health. I had a total knee replacement a year ago that became infected. The resulting surgeries and course of serious antibiotics really challenged me! I’m so relieved to say that this seems to be behind me now and I am back to writing again. EMC: If I don’t start my day reading the Bible and praying, I might as well not bother to write that day! I feel so strongly that the message in my words must glorify God and I pray that it always will. JLL: Are there any particular authors and/or books that have inspired your writing journey? EMC: Laura Frantz!! She is my historical fiction hero! I cannot tell you what a joy it is to have her endorse Saratoga Letters! JLL: Any movies (old or new) that you’d recommend? EMC: One of my favorite historical movies is Last of the Mohicans. It’s definitely not for children, but it is an amazing look at early America during the French and Indian War. I also love the 1939 movie Drums Along the Mohawk. The Patriot with Mel Gibson, the AMC TV series Turn, and the PBS series Poldark are among my favorite historicals, as well. EMC: I currently have two children’s books with my agent. It is a series of books that features siblings of children with special needs. I also will be researching a sequel to the 1777 portion of Saratoga Letters. I am VERY excited about that! JLL: Is there anything you’d like readers to know about you that I haven’t asked? If so, tell us! EMC: I honestly never imagined that I would become a writer of historical fiction. I spent years working as a nurse, and the fact that I now immerse myself in little-known historical tidbits is quite amusing to me! But I am so grateful to the Lord for allowing me this opportunity to write stories that I love and, I pray, that my readers will love as well. EMC: Thank you so much, Jenny, for having me as your guest! Snap up your copy of Saratoga Letters! Award winning author Elaine Marie Cooper is the author of Saratoga Letters, Fields of the Fatherless, Bethany’s Calendar and the historical trilogy called the Deer Run Saga. Her passions are her family, her faith in Christ, and the history of the American Revolution. She grew up in Massachusetts, the setting for many of her historical novels. I’m excited to begin rehearsals tomorrow for a December performance of The Messiah tomorrow with our local community choir! Here’s a sampling from the King’s College Choir. While we may lack their polish and professionalism, we make up for it in enthusiasm. As the weather cools and you spend more time indoors, you might be looking for something good to read. Here’s a list of new releases from American Christian Fiction Writers (ACFW). Enjoy!